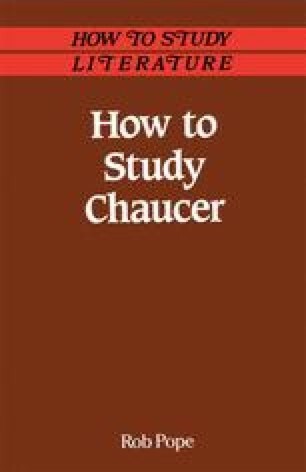 The aims of this book are simple and practical: to help you understand Chaucer in the original language, and to help you form a critical judgement of your own as to what his poetry is about and how it works. We start together from scratch. I assume no prior knowledge of Chaucer, his language, the subjects he wrote about or the society he wrote in. You are shown how to read a few lines and taken on to the point where you should be able to build up a critical sense of the meaning and shape of a whole poem. At the same time you are shown how to use literary and historical ‘background5 material so that it really works as part of a full and informed analysis.